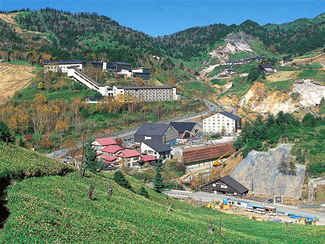 Manza Onsen, an alpine hot spring village, is located in Joshinetsu Highland National Park, 1,800m above sea level on Mt. Shirane. Manza onsen is surrounded by amazing nature and is famous for its high quality hot springs. The spring water, approximately 80 degrees Celsius, contains rich sulfur acid. The fountain pumps 5,400,000 liters of spring water a day. In spring, the leaves on the trees turn beautiful green. In summer, it is known as a great get-away spot. In fall, the leaves change colors creating an amazing view and in winter, people enjoy skiing.